If you are a network administrator, you're under a lot of pressure to ensure that mission-critical systems are completely safe from malicious code, buffer overflows, stealth port scans, SMB probes, OS fingerprinting attempts, CGI attacks and other network intruders. Designing a reliable way to detect intruders before they get in is an essential but often overwhelming challenge. Snort, the defector open source standard of intrusion detection tools, is capable of performing real-time traffic analysis and packet logging on IP network. It can perform protocol analysis, content searching and matching. 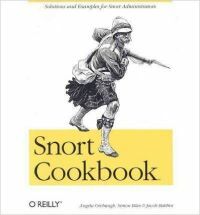 Snort can save countless headaches; the new Snort Cookbook will save countless hours of sifting through dubious online advice or wordy tutorials in order to leverage the full power of SNORT. Each recipe in the popular and practical problem-solution-discussion O'Reilly cookbook format contains a clear and thorough description of the problem, a concise but complete discussion of a solution and real-world examples that illustrate that solution. The Snort Cookbook covers important issues that sys admins and security pros will us everyday, such as: Installation. Optimization. Logging. Alerting. Rules and signatures. Detecting viruses. Countermeasures. Detecting common attacks. Administration. Honeypots. Log analysis But the Snort Cookbook offers far more than quick cut-and-paste solutions to frustrating security issues. Those who learn best in the trenches and don't have the hours to spare to pore over tutorials or troll online for best-practice snippets of advice will find that the solutions offered in this ultimate Snort sourcebook not only solve immediate problems quickly but also showcase the best tips and tricks they need to master be security gurus and still have a life. Jake Babbin works as a contractor with a government agency filling the role of Intrusion Detection Team Lead. He has worked in both private industry as a security professional and in government space in a variety of IT security roles. He is a speaker at several IT security conferences and is a frequent assistant in SANS Security Essentials Bootcamp, Incident Handling and Forensics courses. Jake lives in Virginia. Angela Orebaugh is a Senior Scientist in the Advanced Technology Research Center of Sytex, Inc. Where she works with a specialized team to advance the state of the art in information systems security. She has over 10 years experience in information technology, with a focus on perimeter defense, secure network design, vulnerability discovery, penetration testing and intrusion detection systems. She has a master's degree in computer science and is currently pursuing her Ph.D. with a concentration in information security at George Mason University. Angela is the author of the Syngress best seller Ethereal Packet Sniffing. She has also contributed to Network Perimeter Security: The Definitive Guide to Firewalls, VPNs, Routers and Network Intrusion Detection and the IT Ethics Handbook: Right and Wrong for IT Professionals. Angela is a researcher, writer and speaker for SANS Institute.